Some people love their possessions. They turn to them for guidance, or as just a shoulder to cry on. They know that no matter how bad a situation becomes, their home-theater system or large collection of fine china will take them through that difficult time. Tyler Durden, the theory-spouting anti-hero of Fight Club, once said that the things we own end up owning us. He was right. The Safety of Objects offers further proof. Some people love their possessions. They turn to them for guidance, or just as a shoulder to cry on. They know that no matter how bad a situation becomes, their home-theater system or large collection of fine china will take them through that difficult time. Tyler Durden, the theory-spouting anti-hero of Fight Club, once said that the things we own end up owning us. He was right. The Safety of Objects offers further proof. The story begins with Esther Gold (Glenn Close), a suburban housewife whose son Paul (Joshua Jackson) lies comatose in his bedroom after a near-fatal car accident. As a result of her dedication to caring for him, she has alienated her husband (Robert Klein) and teenage daughter (Jessica Campbell). So to make up for lost time (crazy as this sounds), Esther enters a competition to win a car for her daughter. Backing her in the competition is their neighbor, Jim Train (Dermot Mulroney), a lawyer more intimate with his work than with his wife Susan (Moira Kelly), who responds by carrying on her life without him. 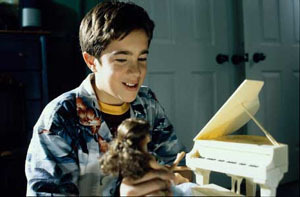 His young son, Jake, is so lonely he has become involved in a heated relationship with his little sister‘s “Tani” doll, a miniature brunette who says exactly what Jake wants to hear. 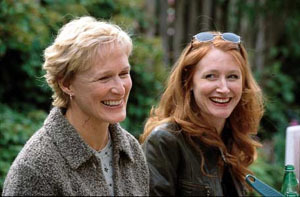 The stories between these characters branch out further as we are introduced to their neighbor, Annette (Patricia Clarkson), a single mother trying to keep herself together while raising her children and her close friend Helen (Mary Kay Place), who has grown bored with everyday life. Unexpectedly, The Safety of Objects introduces us to these characters not scene by scene, but in the darkly humorous opening credits sequence, where they appear in the form of miniature ivory figurines in their milquetoast dollhouses, heralding what they threaten to become. From the start, a message of what these character’s lives are centered on is strong. Once Esther realizes how ridiculous the contest is, she sets off a chain reaction, resulting in her neighbors learning not to rely on possessions but to embrace the loved ones around them. Glenn Close is able to connect with other actors in the film so effortlessly without even making physical contact. While I admired her work here, there is a strong similarity to her character in the poignant Made-For-Cable drama In the Gloaming, which also told of a mother who has watched over her ailing son, and has lost sight of her husband and daughter over the years. She nearly repeats her performance here, as her character and the storyline are practically identical. Viewers who might have seen In the Gloaming could find some difficultly separating the two films. The Safety of Objects is about finding hope and purpose in that which can not possibly offer any. Looking at an old photograph for a sign of meaning (as in One Hour Photo) or a decrepit house as a way of redemption (as in Life as a House) were what brought the main characters back to life. From the behavior of these tormented souls, we learn that just about any object can bring a person back to life, and keep them alive momentarily. But for how long, and at what cost? The film is not about people drifting toward their possessions, eventually losing the battle against being owned by what they own. From the beginning, it is obvious that these people have already given in, that the battle has already been lost. We see the characters wounded by the very knowledge of it. They discover that they will not achieve happiness if they continue to live this way. The film is about letting go of things that we know keep us content in some way but deep down now weaken us, detracting us from the importance of our lives. The Safety of Objects is a vivid tableau that shows us the simplicity and quiet beauty of suburbia. But we are forced to see the broken shutters and chipped paint.